Revenge From Mars is an alien themed pinball, and the sequel to Attack from Mars. 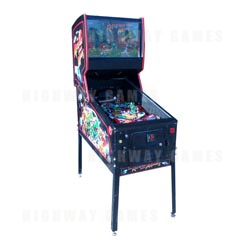 The pinball uses the pinball 2000 system, with a fully interactive video monitor integrated into the rear of the machine. Revenge From Mars was the first Pinball to feature such technology, with the playfield containing virtual video targets. The player must get through 12 waves of aliens. If the player completes any 3 waves they enter the bonus wave, if the player manages to score 40 points on the 3 bonus waves they unlock the mothership multi-ball. The major objective is to light all the saucer lights to begin attacking mars and battle to save the milky way.